Halloween is just around the corner! And while I’m not big into the “gore” side of the holiday, I am all for some cute little spooky treats! And when I happened to see this adorable little spider cake pedestal at Target last week, I of course had to find a use for it. So for this Halloween, I created these fun little Brownie Spiders!!! Granted, I am absolutely petrified of real spiders. (Yeah, I’m that 29-yr-old who screams like a little girl whenever I see one!) But these were on the cuter side with those big adorable eyes, and made from chocolate, so I think I could make an exception for these Halloween treats. 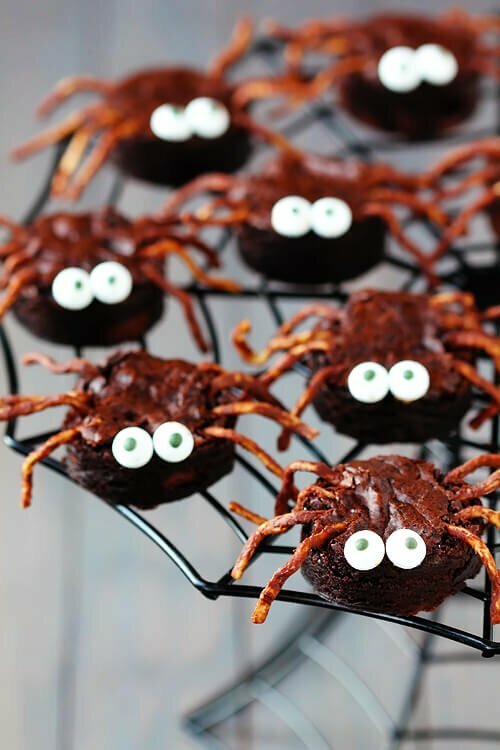 Surprisingly, these little brownie spiders actually turned out to be really easy to make! While it took a little time to poke in all of those “legs” (chocolate-covered chow mein noodles), the rest seriously could not have been easier. All you need is a pan of brownies, some chocolate chips or chocolate, chow mein noodles, some candy eyes, and you’re good to go. And the best part is that these were actually tasty to eat too! Definitely loved the crunch of the chow mein noodles paired with the chewy, fudgy brownies. Wishing you all a happy, delicious Halloween! 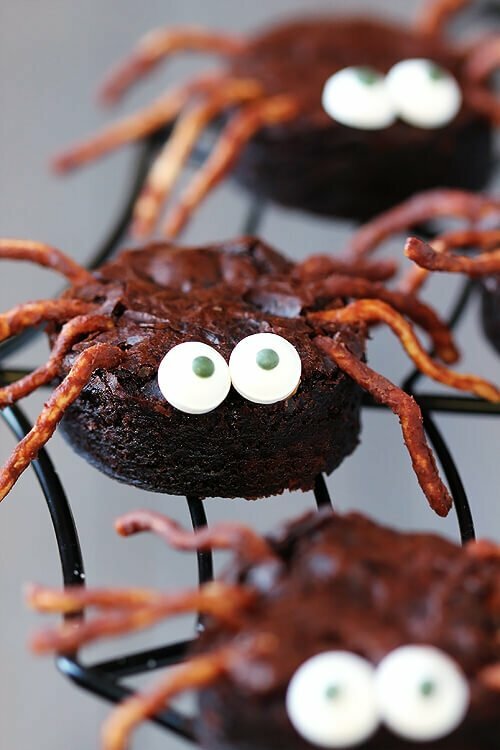 Cute little brownie “spiders” will make your Halloween all the sweeter! Use a circle cookie/biscuit cuter to cut out your desired size of circles for the spider “bodies”. 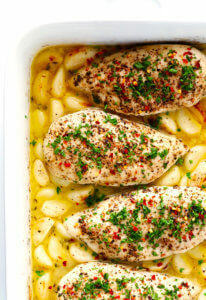 Place on wax paper for prep, or place them right on your serving tray. How cute! I love that you used chow mein noodles – so good! These are the cutest things I’ve ever seen. Soooo fun! Love these! Cute Halloween stuff is definitely better than scary and these are very, very cute! OH MY WORD… these are ADORABLE!!! These could not be cuter!! PS – can’t wait to see you tonight!!! Hi Ali, these spiders are too cute my nephews will love them, this is my first time to your blog love your blog title, I stumbled upon you on Instagram don’t you just love it! These are so adorable, totally pinning these right now. How cute are these! I know the pretzel with chocolate taste so good! Yeah, I have had two larabars and not too eiattsc about them. They do seem dry and lack flavor. However, I think they are all natural. Not sure though. Just pinned these! They are TOO cute! Love these, Ali!!! They are too cute!!! Great Halloween idea, I have to make these! I love those squiggly legs, perfect creepy factor!! Great idea…instead of cutting the brownies, I would just bake them in mini muffin pans…then you won’t have the waste or mess! I am totally petrified of spiders too! I start hyperventilating and sweating. It gets bad. 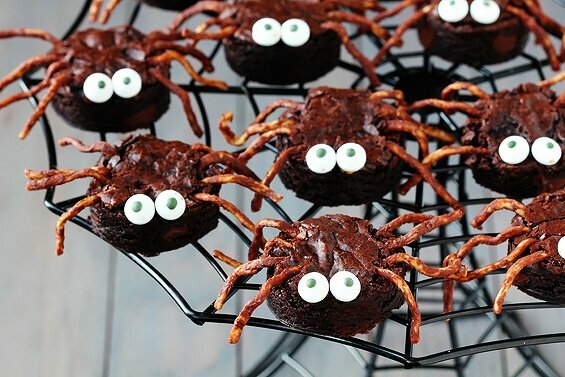 But these brownie spiders aren’t scary at all! They are actually so stinking cute! Get treats! I can’t wait to make these with my Granddaughter!! These are so cute!! What a precious idea, with just enough spook! I’m trying these today. So smart to use chow mein noodles. I’m actually going to use pretzels though so there’s plenty left over for snacks! For eyes I got mini M&Ms that I’ll put a little black dot on and glue on with some icing. yay Halloween! 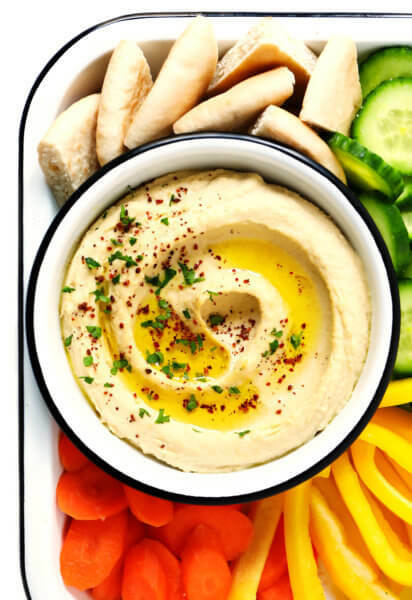 I tried these for my kid’s preschool class – so cool! I didn’t get the candy eyes, however. I used white chocolate chips flipped upside down so that the flat bottoms were the eyes, just pressed them into the brownie. Then I used an edible black gel decorator to put the dots on the whites for eyes. Just as cute! This is so yummy and interesting brownie spiders. I am obsessed with creative desserts! 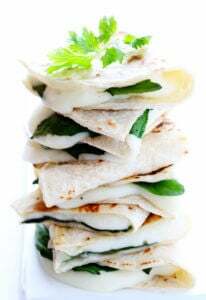 I tried this kind of recipe before but this is unique. Thx Ali! 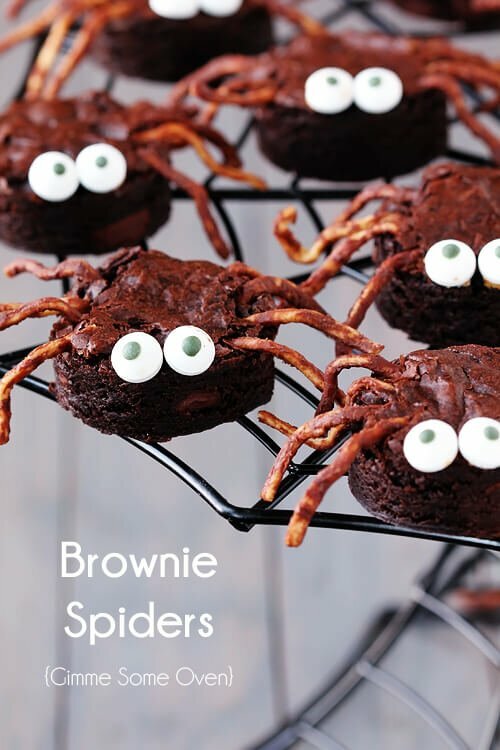 Absolutely love your creative idea with brownie spiders! Never seen something like this! Definitely I will try to make it too! Thx for sharing!